Step off the train into Hong Kong? Notice the Ferraris. Step off the plane into Vietnam? Motorbikes. 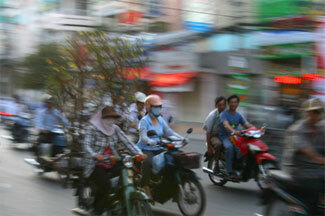 The streets of Ho Chi Minh City1 - all of Vietnam in fact - are swarming with them. Each road filled from gutter to gutter with the gaudy paint-jobs of flashy pink and red. Each bike a sputtering 2-stroke whine, but in symphony, the hundreds - thousands - of bikes combine into a throaty rumble, growling past each intersection spitting out whitish plumes of smoke and the earthy smell of burning oil. Each diving and darting on its own little collision course with the bikes in front of it, totally oblivious to those behind, hellbent on being the first to that imaginary finish line. Each weaving and chirping their horns like a flock of so many noisy birds. Road rules2 are simple - at least to my untrained eye - make that one rule and one strong recommendation. The rule? Don’t hit anything in front of you. The recommendation? Use your horn liberally - while crossing intersections, passing another motorbike or a pedestrian, seeing a friend, slowing, speeding up, traveling in straight line - to make sure your presence is known. Traffic lights? At the biggest intersections we noticed a small red “x” lights after a full day. Now add to this confusion a healthy dose of city buses, cars, cyclos, bicycles, pedestrians, mopeds and handcarts? You have a respectable Southeast Asian city. What’s a foreign tourist to do? The only sensible thing of course - rent one. Taking a look at the map and realizing our one full day in HCMC would be best spent moving fast, we rented motorbikes. Now renting motorbikes in Vietnam is nothing like renting anything in the States. In America if you want to rent a lowly bike - the rusty beach-cruiser with basket kind even - you sign liability waivers, leave credit cards behind and pay in advance. In Vietnam? Hop on. Negotiate beforehand if you want. We found a small cafe with motorbikes out front and bargained down to respectable tourist rates - 50,000 dong (about $3) for Scott & I on our own bikes and double that for Shannon and a driver/guide on her bike - and were off. One small incident involving a patch of sand, the front brake & Scott later we were on our way as part of the flock. A bowl of phở at a former Viet Cong hangout, riding along the peaceful and oh so clean Saigon river, stopping at small temples and trying the bahn mi at the local markets. The day putzing around HCMC was so well spent we ended up on motorbikes in almost every other city we stopped in. Can’t beat ‘em? Join ‘em. Hacking the Hopefuls - All this blather about Web 2.0 and they still have XSS issues. The Way of the Honeybee - Our honeybees are disappearing and we don’t know why. Especially disturbing when confronted with the statistic that a full third of our dietary intake is made possible by the little buggers. Stereograms, Technically Speaking - Diagrams to boot. An excerpt from the State Department Travel Advisory.